Yesterday was our day event on Nantucket so taking it a bit easier today was the idea. After breakfast and the usual conversations with fellow B&B compatriots, we went to the town of Hyannis, where we had been the day before. It felt much more like autopilot as we went there. Our original intent was to take a harbor tour, thus allowing us to possibly glimpse the seals and check out the Kennedy Compound in Hyannis Port. 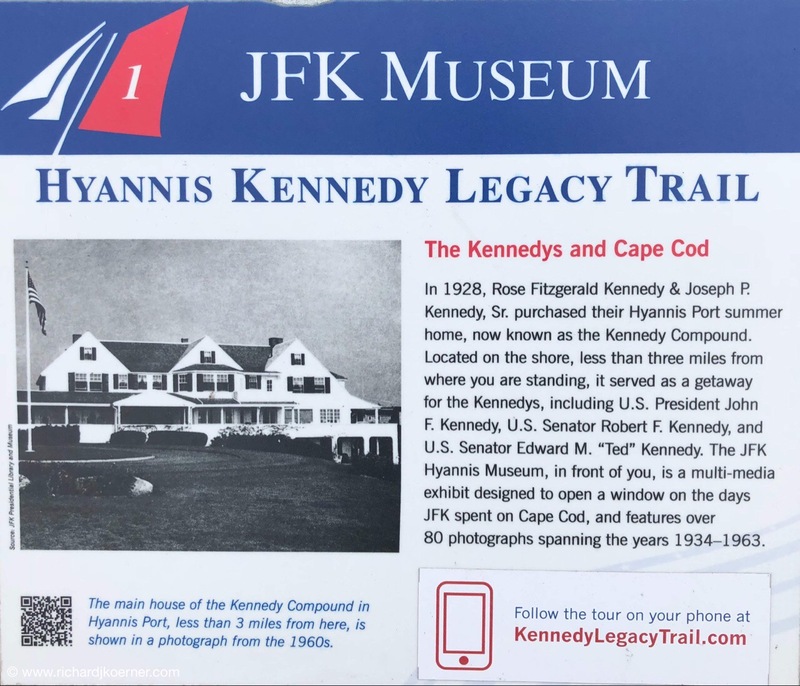 As someone pointed out to us, many people think that Hyannis is the town associated with the Kennedys but it is actually Hyannis Port, which is a village in Barnstable, a short bit away from Hyannis. Our boat trip was not to be, because for whatever reason, they temporarily suspended the trips. 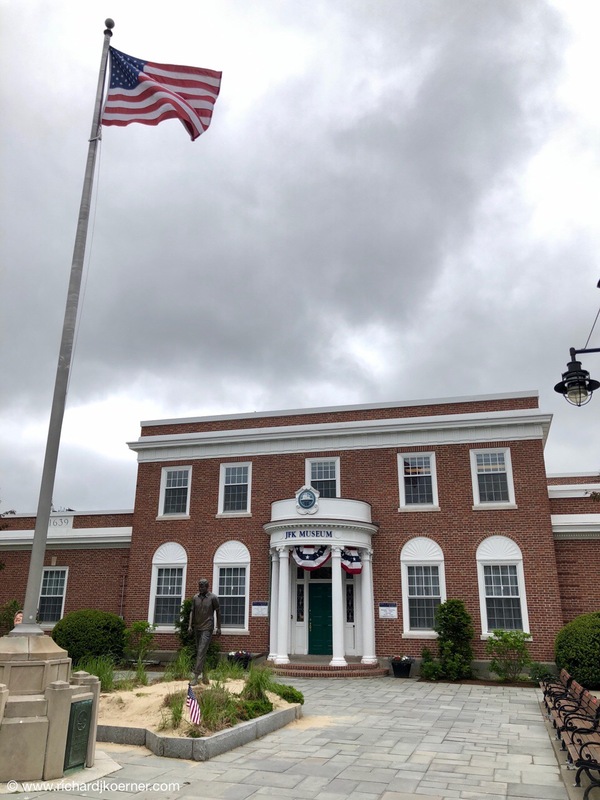 We did have Groupon tickets to the JFK Museum and we didn’t want to miss that (in Hyannis). As it turns out, it was quite memorable, as they had a very unique exhibit from the official photographer of JFK and his family, Jacques Lowe. Joseph Kennedy had chosen Jacques Lowe to do the work before JFK assumed the Presidency. Jacques Lowe was born in Cologne, Germany. The significance of the exhibit has to do with the tragedy of September, 2011. According to Wikipedia, 40,000 of his negatives were destroyed as they were being housed in a vault in the Twin Towers. This happened several months after Jacque’s death. In any case, and according to what we were told, only a few photos escaped and they were only those not in the vault. These photos were showcased in Hyannis. The mood of the exhibit was almost somber and respectful and as MK and I noted, the people were almost more interesting than the exhibit. There were photos and info from JFK’s youth, from the courtship of Jack and Jackie, and from the campaign and subsequent Presidency. So, although Hyannis didn’t impress us as our favorite Cape City, the museum was amazing. Afterward, we went to Hyannis Port to see if we could see anything of the Kennedy compound and we think we were successful in seeing it from afar. We then returned to Orleans, checked out some art galleries, came back and took it easy, sitting on the lawn and admiring the sea. Dinner was in Orleans at the Beacon Room. Scallops and Shrimp for MK and duck in pineapple and blueberry sauce for me, landlubber that I am. This entry was posted in Cape Cod, Life in general, Thoughts and philosophy, Travel. Bookmark the permalink.